Buy Schlagfix Soya Vegan Spray Cream 200ml in the UK from our online shop or directly from our independent Scottish store. 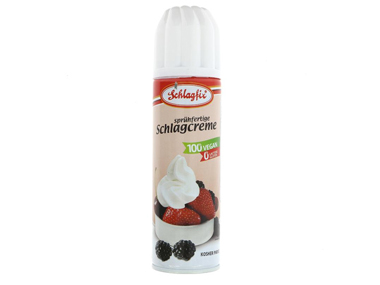 Schlagfix Leha soya vegan dairy free spray cream is a ready-whipped topping cream based on soy. Suitable for vegans. No lactose, no dairy, no gluten. Ideal to use on desserts, cakes, baking or on your hot chocolate. For best results keep in the fridge before using. Who says you can’t have chocolate puddings without dairy?! I thought it would be hard to get a soft consistency, but the whipped Soyatoo cream worked really well and in a blind taste test, dairy eaters, wouldn't realize this chocolate pudding is actually vegan! This recipe contains 150ml Shlagfix Soya whipped cream. We sell real Schlagfix and other Dairy Free Drinks & Creams directly from our shop in Scotland and online throughout the UK. View more products from Schlagfix. Where can you buy real Soya Vegan Spray Cream safely online? If you are wondering where you can buy Schlagfix Soya Vegan Spray Cream 200ml safely online in the UK, then shop with us. Soya Vegan Spray Cream - Schlagfix Soya Vegan Spray Cream 200ml in Dairy Free Drinks & Creams and Drinks.